We've always called my Mom's Dad, Papa. He grew up in New Jersey with his parents, grandma, grandpa and aunt. In a house with 5 adults, he was the only child! That's a huge reason why, during the Great Depression, Papa was one of the very few kids that had braces on his teeth. He loved riding motorized things, especially Indian Motorcycles. Papa's dad owned a bicycle store and he loved helping in the shop. Papa got polio in his right arm which later prevented him from joining the military. This was a lifelong sadness for him because he loved the United States. He attended Colgate University and achievied a degree in Psychology. He was a Republican through and through. But not just any old Republican, a Reagan Republican. In his den at my grandparents house, he had a huge poster of Ronald Reagan wearing a cowboy hat. He loved listening to Rush Limbaugh and conservative talk radio. I have many memories sitting in the backseat of Papa's yellow Volvo, VW Vanagon and pickup truck listening to El Rushbo. He retired from Liberty Mutual after 35+ years of working for them. He met my grandma at a company picnic and left a big impression on her by throwing her in to the pool. Little did he know, she didn't know how to swim. Amazingly, this was the beginning of their short dating and engagement. They got married February 19, 1949. This past February they celebrated 64 years of marriage. It was Liberty Mutual that caused him, my grandma, mom, and her brothers to move from New Jersey to California back in the 60's. When my grandpa retired from Liberty Mutual he bought a convertible Volkswagen vanagon. He and my grandma spent a few weeks/months traveling to the East Coast to visit all of their relatives the summer he retired. When they got back home, he would take my sisters, brother and I camping, excursioning, and exploring in that vehicle. We fondly called it the Campening. Papa loved exploring nature and learning new things. He always loved medicine and I think if he could go back in time, he would have become a doctor. After he retired he logged more hours volunteering at Kaiser Permanente than any other volunteer in their history. Volunteering kept him thankful of his age and his health. He also loved music. He had many different guitars. My personal favorite was his Hawaiian guitar. He had a slide and would play it for us frequently. My siblings and I were picked up by Papa on Thursday mornings. We then spent the day doing schoolwork, eating lunch, and activities in the afternoon. Papa would take us on adventures. One time, we went in the Campening and he blindfolded us. He was teaching us about our taste buds. He had small bags of little treats and things to eat. Sour, sweet, savory, etc. He taught us about moss growing on the North side of trees. He taught us how to use a compass. He didn't want us to get lost if we were ever stranded in the wilderness. Papa and Grandma taught us about money too. They had a banking system called Coryell's Bank and Trust. It consisted of 4 ledgers with each of our names on the books and little banks they would put money in. We would earn money for chores or various projects they assigned. The point of these little banks was learning that money doesn't grow on trees. It was a fun way to learn about earning, saving and spending. Papa had three primary areas of the house that belonged to him. His den: where he always had a computer with games on it for us kids. His shed: where he had woodworking equipment and tools. His garden/the backyard: where he had a giant garden, fruit trees, and a big tree-swing. He was also in charge of the wood-burning stove and kept us SUPER toasty in the wintertime. I never saw Papa get mad at Grandma although he did raise his eyebrows at her many a time. He would try to help her make dinner, but she would always shoo him out of the kitchen. She would use his vegetables to make her salads and lemons to make lemon bars. Papa always had a garden outside in the backyard. The soil in that garden was premium quality. He would use cow manure and horse manure to ensure it was pristine. He had lemon and orange trees in the backyard too. I've never seen anyone with as many zucchinis, lemons, and oranges, as Papa. He loved garlic with his salad, but it would always give him gas. We were all ecstatic when a company invented Beano. When Grandma would let Papa in the kitchen, it was primarily for breakfast. He made the best eggs you've ever eaten. They introduced us to Taylor Ham, a very salty meat that is fried and served alongside pancakes, eggs, etc. The other tasty thing Papa would make is his spaghetti sauce. This sauce took all day and was full of meat and everything Italian. It is best with angel hair pasta. They also made the BEST cold cut sandwiches because they always bought fresh meat and cheese from the deli. Papa has always been one of the most generous people I've ever met. He would give you the shirt he was wearing if you were to tell him it was nice. He had a tendency to spoil us. He would try and sneak candy to us before dinner to hear Grandma yell at him that we better not spoil our supper. Papa was always supportive of any endeavour we would try. And not just verbally supportive, financially too. He and Grandma paid for the majority of all of our braces, helped my parents with extra-curricular activities, guitar lessons for me, piano lessons for Heidi (thank God for that or I would have never met Anthony), voice lessons for my sisters and me, and even helped pay for our college. I could hardly drive to their house without them trying and mostly succeeding at giving me money to help pay for gas. They would always treat our family to dinner whenever we would go out and get mad if my parents tried to pay. Papa and Grandma welcomed everyone in to their home. They had a prayer list that lasts for about 30 minutes when prayed all the way through, maybe more. Before we started dating, they had a soft spot for Anthony. I think it's because he and Papa shared a love of guitars. When I told them we were together, they were elated. Sadly, Anthony was with my sisters and cousin when we found out my Uncle Ray had died. At his memorial service, Anthony, Heidi and Heather all played and sang. I remember how much it meant to my grandparents, especially Papa, they had played for his service. 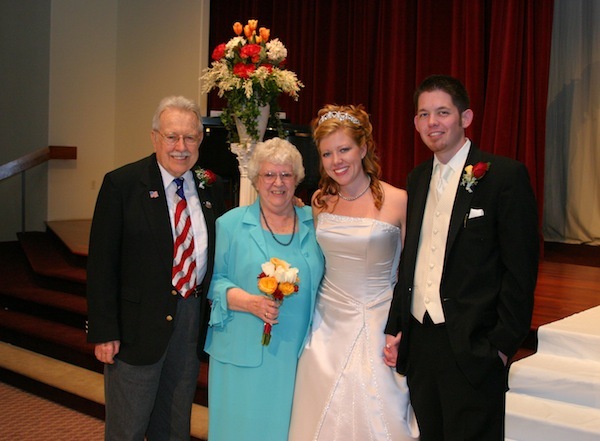 At our wedding a few months later, Anthony and I honored them for being the longest married couple in attendance. And, it was only fitting that the true Patriot Papa was shone through. He wore a suit and his tie had the United States flag on it! Seeing them age has been one of the hardest things about being an adult. When Papa fell a year ago, that began his health decline. There were times when I didn't want to see them age, so I would let more time go by in between visits. I then realized I would regret not seeing them. I loved visiting them because they would always encourage me in my faith. They would tell me about times they heard the voice of God and listened to his leading in their lives. It was sad when we told them we were moving to North Carolina, but they said that if God was telling us to go, we had to listen. They faithfully prayed for Anthony and I in whatever area we needed prayer. When we had trouble getting pregnant, our baby was prayed for daily by them. It was a huge answer to prayer when I told them we were expecting our first baby. On May 27th, the day we started our move to Raleigh, we stopped by their house and gave them hugs and kisses. When we visited Sacramento at the end of September we also saw them. We told them how life was in a new city, how the church was going and that Anthony was playing on the worship team. That made Papa very happy. He tried to give us a number of items in their home, but we said we couldn't fit them in our luggage. We also got to tell them what we're planning to name their great-grandson and they thought it was a strong name. When we left, I said, I love you and I'll see you soon. I hadn't expected that it wouldn't be so soon for me. Papa passed away peacefully on October 19, 2013. He is in heaven rejoicing and playing his guitar with a host of other musician friends. He is in no pain, physically or emotionally. I rejoice that he is reunited with his two sons, Ray and Mark. And that someday we will join him. I will always remember my loving, generous, compassionate, and caring, Papa. I wish he would have been able to meet our son.